It's been five months since we authored and published a post on this blog. Around the time of our last update, we were preparing to move our half-finished bus to a new parking spot and to move into it full-time. We had a bed, powered cooler (as a fridge|freezer), pantry shelf, tub, and a plethora of tools. We finagled a couple of tables, packed my desk into the front "room", and secured a parking spot we thought would be our long-term base in which we would finish our home. Along the moving journey, we learned a few things about leveling land, laying gravel, and adjusting to life off-grid. 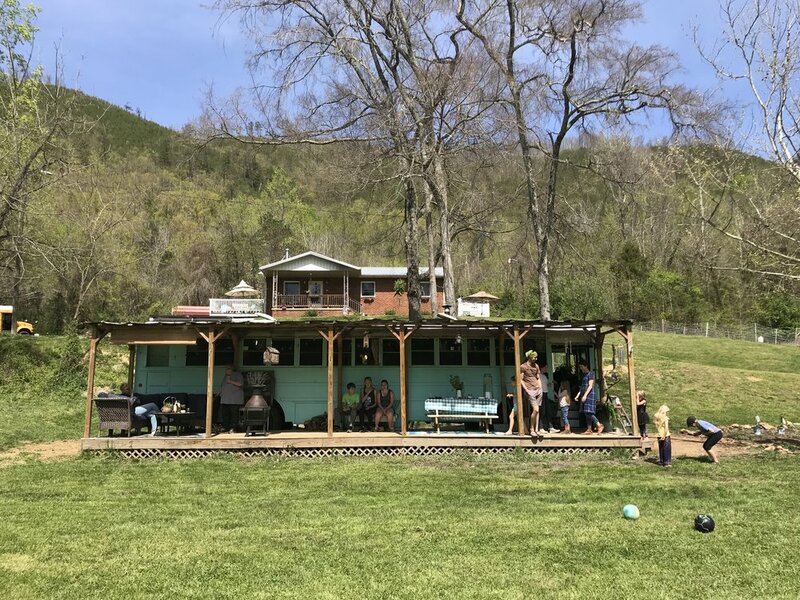 On April 14th, we embarked from the squeezed parking spot at the cabin and headed to Tiny Mountain, a property owned by two fellow tiny-home dwellers. In the four months since the move, we have worked hard, slept less, lost a beloved pet, and watched our secure parking situation dissolve entirely. We've made little progress on the completion of our home; toward our dreams of traveling. We've clung to one another hurdling full-speed through a thorny thicket of unknowns. A combination of life's difficulties and our determination to stay afloat led to our ultimate abandoning of this blog. What progress was there to share? What could we celebrate with beautiful photos and tales of triumph? What could we actually offer? Stepping back into this space, this blog, I realize just how wrong that was. 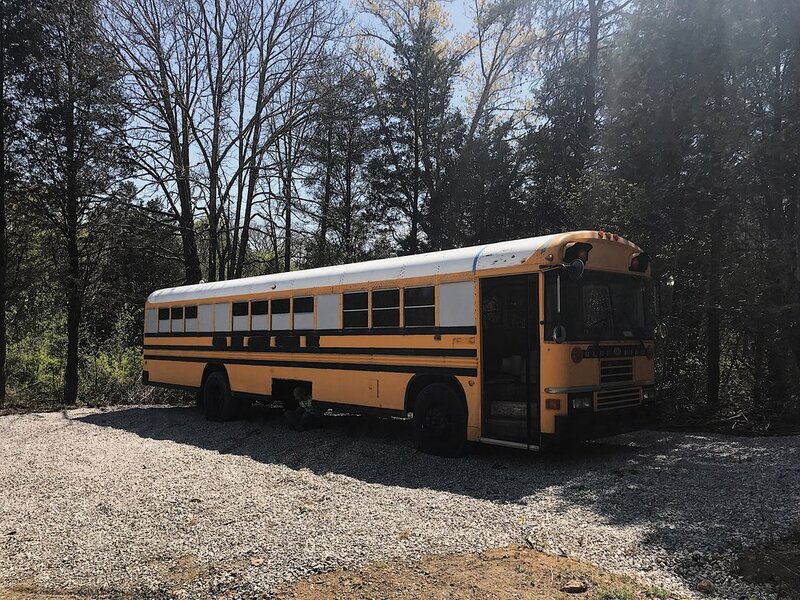 When we began our skoolie build, we were stoked to share our journey. Our copious hours of research and excited dreaming materialized into a bus titled in our names, slowly coming together by the work of our own hands. We wanted to share the ups and downs, the ins and outs, and celebrate with fellow builders along the way. Yet, along our path, we began to stray from that intention. "Don't post that; it's not done yet." "Let's not share that; it might not be done right. I wouldn't want anyone to see us doing something like that." "No one wants to see this." Mistakes piled up as they do when you're going after something enormous, something uncharted and unwilling to be tamed. Doubt crept in and our voices raised and the road ahead became fuzzy. More and more, our decisions seemed like the wrong ones. We left our temporary home at the cabin with our bus, our things, and our pets promising ourselves we'd finished our utilities soon. We'd work day jobs and make a little money and continue to press onward toward a completed home. We put up a ceiling that became a constant reminder of a fight and a failed attempt. We watched days turn into weeks on the calendar as we put off bus improvements. Building a home is harder than we could have ever imagined. Thirteen months later, and almost two years after we both turned to one another and said, "Let's build a tiny house and live in it, together," in spite of the challenges, disappointments, and disagreements, we are doing just that. We bought a school bus we learned was a little short in ceiling height and a bit long in length. We bought our composting toilet early and are beyond grateful we did because when we began to run out of money, our waste habits would've been drastically different without this early investment. We disagreed on how long it would take to build. How much it would cost. How to do this and that. And we learned that both of us have some growing to do in the realms of communication and compromise. We bought everything one could need to install electrical + plumbing and somehow managed to procrastinate it for months, against our best intentions. We continue to feel the pressure and disbelief from our friends and family, who no matter what we do or don't do, seem to think we're failing or close to it. We still dream of having a beautiful, complete, cozy, traveling tiny house. And after all this time, we're starting to learn that it's okay to be in-progress. Going against the grain, differing from the path laid out for us all, and going forth into the unknown will inevitably have challenges that don't get neatly wrapped up and solved at the end of every episode. Where we will park next, knowing we must leave where we are this month. If it's legal for us to be anywhere because living full-time in an RV is trickier (and riskier) than we could have conceived. Whether or not we'll be able to afford the land we've found and are dreaming of clearing, naturalizing, and transforming into a homestead. When we will have the energy, money, and support to finish our home. It's painful to share the truth, especially when it’s disappointing. When you feel like you've failed. It's embarrassing, humbling, and it seems pointless. Why would anyone want to read it? Why would anyone want to hear about it? Maybe you've experienced this, too. Maybe you've wanted something so badly - something no one else understood - and you knew that no matter what, you had to go after it. "This will not be another thing we don't finish. We're going to build this bus. We're going to complete it. And it will be our home." We haven't failed yet. We're still trying. There may not be some grand plan, some bulleted list that makes sense to the outsider with dates and accountability and a budget down to the cent. We don't even have a clue where we will live. But, we're not giving up. To those that do believe in us, who have helped us along the way, and who light up when we get to talking about the Slow Rolling Home, we couldn't do this without you. Find a plot of land not too far from our current jobs to park the bus - we may miraculously create the means to purchase this land or may happen upon a generous individual with space to let temporarily while we continue to search for our future homestead. Work diligently toward winterizing our space, so our base needs (and those of our pets) are ready for the East Tennessee winter. Thankfully, winter isn't so bad here. Cultivate joy, coziness, and comfort in our space, no matter the state of its "doneness." "What if home is not a place, but a feeling?" We visited Blue Ridge Conversions in Hot Springs, NC! And met so many like-minded individuals. We’re due for a visit again soon. Being around folks who not only understand the dream but who live it re-energizes like no other! A new (to us) Subaru! We sold our faithful Ruby the Subaru to a nice guy via Facebook Marketplace and bought a 2014 Subaru Outback. Her name is Ruby, too. As cozy as we can be. We got to know our space eventually caved and bought a futon. Having a pseudo-couch changed everything. Developed lots of 35mm film. And experimented with expired film and alternative development methods. Alhen has a long history with film photography and Amelia had never developed her own film, so throughout the summer, we went to the darkroom every week to develop our latest film adventures. and visited some friends from across the country. Of course, Amelia needed a photo with this fox mural. We floored 2/3 of the bus. But ran out of flooring (and money) to finish the back portion! We’re still working on it. We've made Wednesday Walks a weekly ritual. Sometimes we go hunting for treasures. Architectural Antics is one of our favorite local destinations. Stumbling into new museums is always a pleasure. We visited this museum just before it closed. Alhen produced a stellar gem from a strange roll of Soviet film. And he began teaching hammock camping workshops! We went camping in the Smokies. Arguably a 15 - 17 mile round trip and 100% worth it. We camped in our hammocks, ran out of food early, and got caught in a downpour on our way out. All in celebration of Alhen's birthday. And saw the bus for the first time since we gutted it in Florida and drove to TN 13 months ago. We had a rare photo taken of the two photographers (us) together. Amelia’s stepdad was more than happy to take the camera every time she asked (which was often) to snap pics of us together. We stayed at a cabin in Cataloochee Nat'l Forest with some friends from across the country. And enjoyed three solid days of downtime just after we learned we’d have to move from our current parking space. It wasn’t easy, but recharging and re-centering with one another was necessary.